Leadership preparation through expanded critical thinking, a competitive advantage in the workplace and the excitement of discovery and creativity were among the reasons why prospective graduate students were encouraged to pursue an advanced degree from the Southern Illinois University Edwardsville Graduate School during its Open House on Wednesday, Oct. 19. 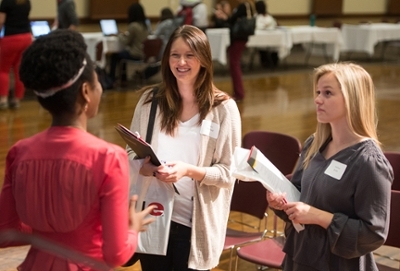 More than 300 prospective students received information on SIUE’s more than 40 master’s programs, post-baccalaureate certificates, specialist degrees, doctoral degrees and cooperative doctoral programs. During the event’s two sessions, approximately 270 individuals applied for Graduate School, an increase of more than 30 compared to last year’s open house. The Graduate School offers a diverse array of programming that offers unique opportunities for students to meet emerging industry trends. “Our integrative studies degree option offers students the opportunity to pursue their interests by combining areas of study to create their own specialized program,” explained Zenia Agustin, PhD, program director and professor in the Department of Mathematics and Statistics. Representatives from the Graduate School, Graduate Admissions, Financial Aid, Testing Services and the Career Development Center were also at the Open House to discuss topics such as flexible financing options, educational funding and the track to student graduation. Photo: SIUE graduate student Adebanke Adebayo answers questions and offers advice to prospective students Mary Stanfield (L) and Melissa Britten (R). 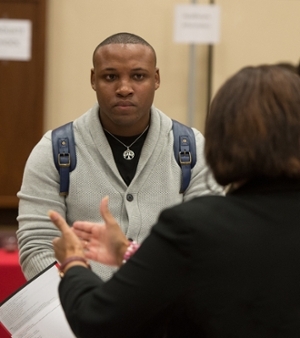 Nathan Brown Jr., of Chicago, inquired about the college student personnel administration program during the SIUE Graduate School Open House.